Back in the day, a trash compactor seemed an absolute necessity in any modern kitchen. Recently though, it’s become a bit out of date. Many families find they rarely use their compactor. In fact, the appliance has even become obsolete to some people. Garbage disposals can take care of most food waste and trash output has declined due to the popularity of recycling and reusing. This being the case, quite a few families these days have opted to remove their built-in trash compactor and replace it with an appliance that provides a little more function to their kitchen. Wine coolers are becoming increasingly popular today and are generally around the same size as a built-in trash compactor. Because of this fact, a lot of people have opted to switch their compactors with a built-in wine cooler. And since wine coolers come in a variety of different widths and heights, you’re nearly guaranteed to find a model to fit the hole your trash compactor left. Still, since compactors and wine coolers can vary in size, it’s always important to measure the depth, height, and width of whatever unit you’re replacing. Remember, when creating your perfect kitchen, a tape measure is one of your best friends. Below is a small sampling of some of the most efficient and reliable wine coolers on the market today. 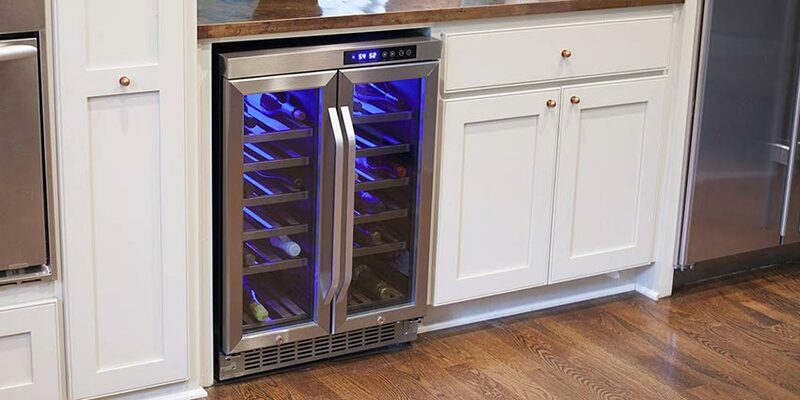 Use this list as a jumping off point to find the right wine cooler (or other appliance) to replace that outdated and underused trash compactor. 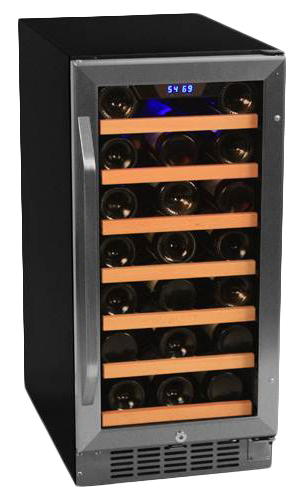 While this EdgeStar model can act as a freestanding wine cooler, it comes in at a slim 15 inches wide and 32 inches tall, making it ideal for filling in that space where the compactor used to go. In addition, it’s sure to be easier on the ears than some noisy compactor. Despite being so slim, this unit can easily hold upwards of 20 bottles. 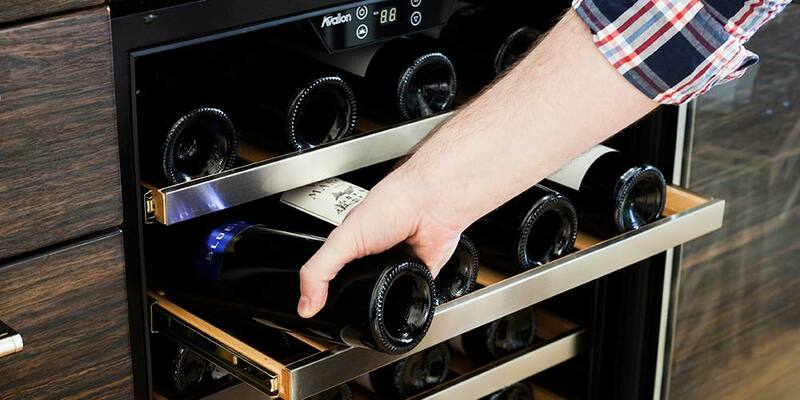 It’s even dual-zoned, allowing you to store more than just one type of wine. 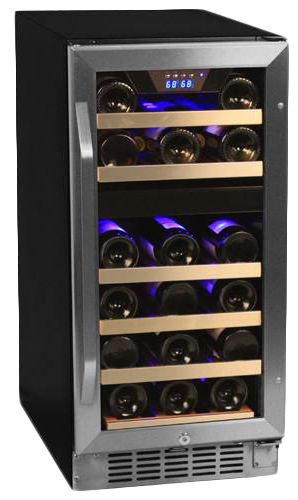 The lower zone is larger, holding up 18 bottles and has a range of 40-54 degrees Fahrenheit; the upper zone holds less wine (8 bottles) but has a range of 54-65 degrees F.
The temperature in the unit is controlled by slick LED digital controls, and it’s lit with soft, blue interior LED lighting. Tinted glass protects your collection from potentially damaging UV light, and a security lock keeps the wine safe from prying children hands or uninvited wine thieves. And of course the stainless steel exterior complements just about any modern kitchen. The design is–in a word–timeless. Similar to the 26 bottle dual unit listed above, this model comes in at a slim 15 inches wide and only 32 inches tall. This unit comes with an internal fan to help evenly recirculate air and allow for even cooling with no unwanted especially warm or cool spots. Due to this model not having a dual zone feature, it can store more bottles. 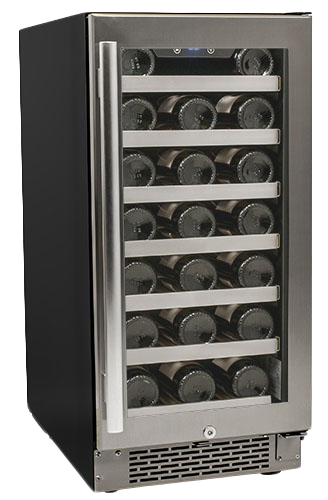 This EdgeStar unit maxes out at 30 wine bottles, yet still has a wide temperature range, reaching anywhere from 40 to 65 degrees F. The stainless steel exterior looks snazzy and sleek, while tinted glass ensures your wine is safe against dangerous UV light. Still, it’s not dark enough to keep you from peeking through the glass to keep an eye on your collection. If the space left behind from your trash compactor turns out to be narrower than you anticipated, try this extra-slim EdgeStar model. In addition to the sleek, classic design, this model’s width comes in at just under 12 inches, making it ideal for a tiny kitchen nook. 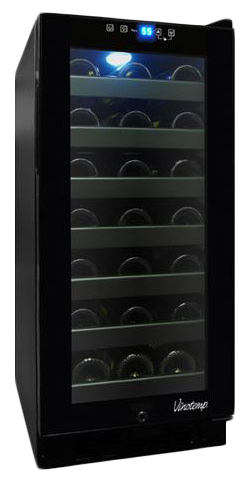 Still, it can fit 18 bottles and has a wide temperature range that extends from 64 degrees down to 40 degrees. 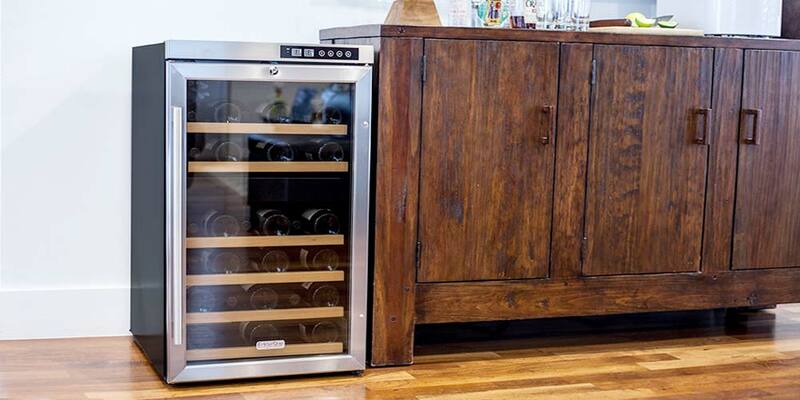 This means you can store anything from your favorite Cabernets to a mixture of sparkling wines. 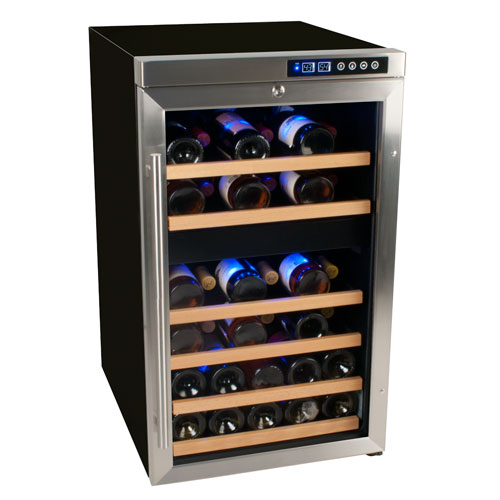 Just like the other EdgeStar models this unit come equipped with tinted glass, protecting your collection from those potentially harsh UV rays while at the same time allowing you to easily view your bottles without constantly opening the door. In addition, this model even has a built-in carbo filter which acts as a barrier against harmful odors that may try and seep into your unit. 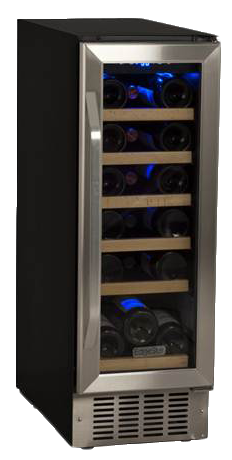 This Vinotemp wine cooler has a number of neat features that will push the memory of your old, clunky trash compactor to the back of your mind in no time. At a width of just under 15 inches, this model is highly compatible with a lot of various spaces in the kitchen. And despite it being quite compact, it can fit up to 33 standard sized wine bottles. Its temperature range is also superb. It can sit at a low temp, around 40 degrees for your sparkling wines, or it can reach as high as 72, allowing you reach nearly any temperature your collection calls for. And since this unit has a front ventilation system, it needn’t be used only as a built-in model. Feel free to utilize this wine cooler as a freestanding appliance as well. The digital temperature display, complete with touch screen control panel makes for quick and easy temperature regulation. 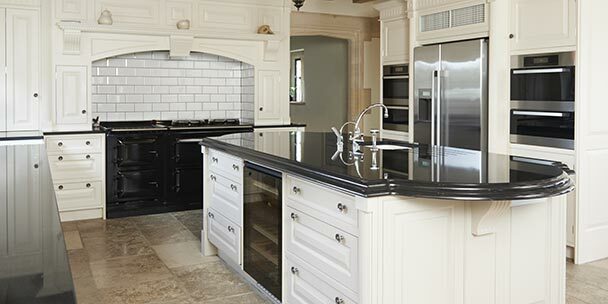 This cooler comes in a slick, solid-black trimmed door, black shelving, and black cabinet. And the soft blue LED lighting adds a nice, subtle touch of class to the already aesthetically pleasing overall appearance. There simply is no shortage of slim, attractive looking wine coolers that fit neatly into whatever space is left behind from your old compactor. Of course this Avallon model is no exception. At a modest 15 inch width, it still can fit 30 of your favorite bottles from your choice collection. It also has an integrated safety lock, touch screen digital controls, a wide temperature range (40 to 65 degrees), and a seamless stainless steel doorframe. The six shelves inside are constructed of sturdy wood and roll out, making wine storage and categorization a snap. The glass in the door itself is actually preservation glass, making it extremely durable. It’s even filled with argon, which helps to filter out those harmful UV rays, heat, and any other environmental elements that could potentially damage your wine. An integrated carbon filter prevents unwanted and harmful odors alike from seeping in and messing with the taste of your wine. If you’ve been dying to get rid of that old trash compactor that’s simply gathering dust, but you’re worried about the eyesore that the empty space will create, have no fear! As shown above, there are a number of quality, well-made wine coolers to fill that lonely, little space. 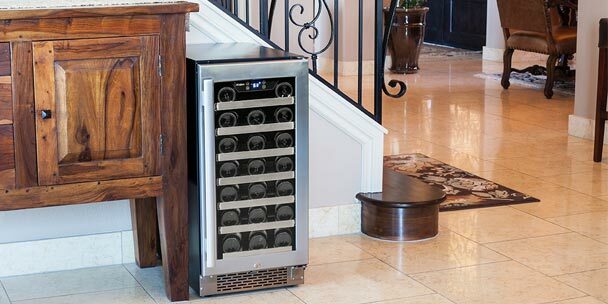 Even if you’re not an ardent collector, a new, slim wine cooler could be just the appliance you need to get you into the scene. 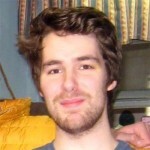 Follow the old words of advice from your high school Latin teacher: Carpe Diem! Seize the day, do some wine cooler research, and take your kitchen in a fashionable and exciting new direction with a snazzy, slim new wine cooler unit.